The Admin Interface gives you access to the features of WordPress. It is organized into four sections: the Admin Bar, Navigation Toolbar, the Work Area and the Footer. [toc]The Admin Bar is available when you are logged in to your site. You will see it from the public view and from the admin view. 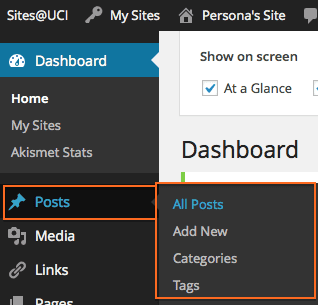 If are a member of more than one site hosted on UCI Sites , you can access your other sites from the My Sites drop down menu. Your Site – Links to the public view of your site. Comments – Administer any comments on your site. The large area in the middle of the screen is the Work Area which changes as navigation choices in the Navigation Toolbar are selected. 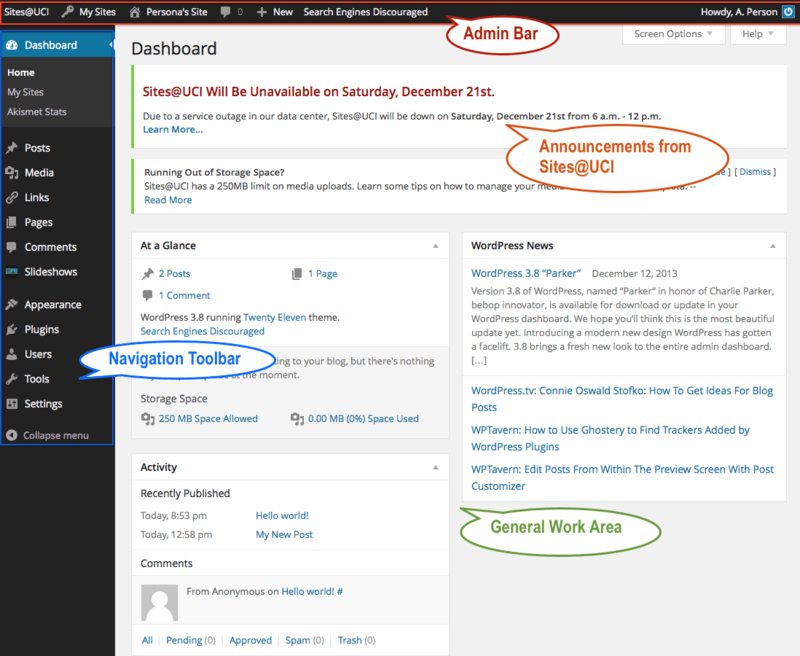 When you first log in, the work area shows the Dashboard which gives you an overview of your site. The main navigation toolbar is located on the left side of the screen. It contains the Dashboard and all of your site tools. The Dashboard is located in the upper left corner of the page. Click on Dashboard to load the Dashboard and automatically expand the Dashboard menu. You can decide what you want to see on the screen by selecting the Screen Options tab. This will expand the “Show on screen” options and you can select what you want to see in the Dashboard. The following options are the default. At a Glance panel – Shows how many posts, pages, categories, tags, comments and spam you have on your site, is a concise overview of what’s going on, and also displays the current theme selected and how many widgets you are using. If your site is Private, it will display “Search Engines Discouraged”. 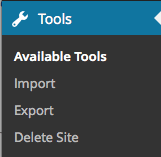 WordPress has “fly-out” navigation tools. Hover over each section to see the options underneath. If you click on one of the sections, that section will expand and stay open while you are on that set of tools. 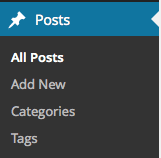 The Posts tool is where you can add new posts, edit existing posts and edit tags and categories for your posts. The Media tool includes your Library that lists any images, audio and video files you have already uploaded. The Add New link helps you upload new media to your library. The Appearance tool allows you to change the look and feel of your site. We have over 50 themes loaded and themes can be changed at any time. Click on each theme to preview what it will look like before you decide. 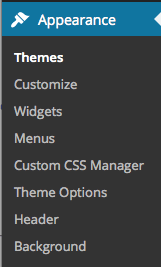 Any options that come with the theme you have selected will be located under the Appearance menu. The Users tool shows you the people contributing to your site. You can add other people who have a UCI email address to your site as authors, editors, contributors, etc. You may also edit your profile here. The Tools tool has a couple of WordPress specific tools for your browser. 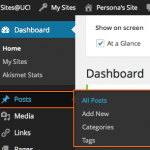 You can also import your posts or comments from other blogs to your site. The Settings tool is the main area to set preferences or properties for your site.